SO! Again....5 posts in a day?!! AND now a slump in front of TV.....Hopefully I'll return before Christmas!!
" Three Sisters And A Tempest..."
It's an intriguing story, fusing Chekhov's Masterpiece " Three Sisters" with the lives of the Bronte family. Director Jane Barth expertly transported us to windswept Yorkshire, where the scene was, of course, Haworth parsonage.And there were all the right ingredients. BUT amid the sadness, humour seeped into much of the play, particularly from Mary Pemble as Tabby the housekeeper....John Mackay as the Teacher......Veronica Herd as oduious Mrs Robinson, pursuing the infatuated Branwell. 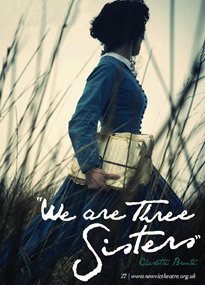 AND Danielle Carrington as Anne, Laura Smith as Charlotte and Rose Eliott as Emily Bronte, all excelled as the yearning sistersin their prim Victorian frocks.......revealing their differences as clearly as their sisterly intimacy. Mention must be made too of the set design ( Tony Kemp), Jane Barth) and particularly Jill Kemp's excellent art work. A trip to Theatr Clwyd Cinema....New York Metropolitan Opera's Live Showing of " The Tempest" Absolutely fabulous. Not well up on opera...BUT this gave a definite desire for MORE?
" Peace And Quiet In Mr. Gladstone's Sitting room...."
We had a lovely day at the library, enjoying the workshop and Ian's company....and of course, we lapped up the Library's wonderful atmosphere. Certainly looking forward to another visit again soon...! PS: During LitFest, I joined another workshop...like Simon Armitage's, the venue was Chester Town Hall. This time, BBC producer Duncan Minshall, talked with us about writing stories for Radio. Very interesting. ONLY last week, my brother called into my writing class to tell of his trip to Palestine. He and my sister in law made a revealing trip there in February. A. gave us lots of background....historical, geographical, economic, social and of course, political. A. also told us about the many stories Palestinian women had posted on the walls betwixt towns and villages. BUT most of all, it was shocking to hear news that evening.....dreadful problems had erupted there in the Gaza strip.... only that very day....AND we had just been given so much food for thought.
" Will Self:Watched Over By Aristocrats..."
Prof Will Self is controversial . No doubt about that. So when he lolled onto the Town Hall stage, all 6ft 5ins of him ( oh so relaxed in jeans and trainers), standing beneath the beady aristocratic eyes of several of the Westminster's, we sat up in our seats, eager to meet him. AND we weren't disappointed: his views are as controversial as his writing and his self. Its prose is experimental. Extremel experimentaly: one may not like it! Writers like William Burroughs and James Joyce inflence.
" Umbrella" is a mix of sci-fi and fantasy.....splashing along as a rapidly flowing " stream of consciousness". It zaps betwixt tenses and time zones....characters and plots....dialogues and settings. AND while sentences stray and straddle, words bloom into italics ...to shock and surprise.
" The Observer" declared that Readers might require " a bit of a lie-down" after sheltering under this particular umbrella...I think they may well be RIGHT! BUT IT WAS A TREAT to meet such a brilliant zany character during LitFest. CHESTER NEEDS FOLK LIKE HIM! SELF says: " I write to astonish people!" . AND believe me he does!! 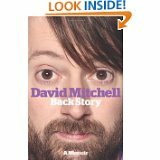 David Mitchell has long been a favourite in my family so we couldn't miss him during Chester Lit Fest. He was very warmly welcomed by his audience in Chester Town Hall... and all enjoyed his chat wirth Alex Clifton. Since then, Mitchell has married Victoria Coren, sister of Giles and daughter of the late Allan. Needless to say, Robert Webb was Best Man.